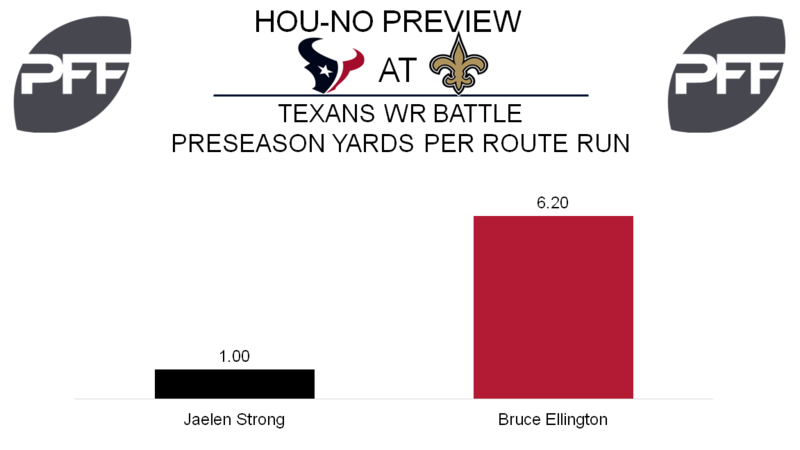 With the Texans receiving corps banged up, both Strong and Ellington have the chance to make a lasting impression in the “dress rehearsal” game. Through two preseason games, Strong has played 51 snaps, and has hauled in all three of his targets for 29 yards and a touchdown. That’s good for a passer rating of 146.5 when targeted. In that time however, Strong is averaging exactly 1.00 per route run. Signed a few weeks ago by the team, Ellington put on a show last week in his Texans debut. Playing 32 snaps, he hauled in four of the five passes thrown his way for 93 yards with 41 (10.3 per reception) coming after the catch. For the game, Ellington averaged 6.20 yards per route run and Texans quarterbacks had a passer rating of 118.8 when throwing his way. It will be interesting to see if the rapport he showed early on with Tom Savage continues this week. The Texans’ unofficial depth chart reads ” Lamm or Giacomini” will be holding down the right tackle spot for this week. Last week against the Patriots, Lamm recorded an overall grade of 78.3 on 38 snaps and a pass blocking grade of 81.9. Giacomini on 21 snaps recorded an overall grade of 47.4, and had a pass blocking grade of 45.2. Through two preseason games, Lamm has a pass blocking efficiency of 95.6 compared to 92.9 for Giacomini. Zach Cunningham: Through two preseason games, Cunningham has been the run stopping linebacker everyone felt he could be when the Texans drafted him in the second round from Vanderbilt this past April. Against the Patriots, he showed coverage is still an area of his game to improve upon. When Cunningham was targeted last week, the Patriots completed three of three passes for 53 yards and two touchdowns (both of which came on angle routes). Going against a Saints team that has shown a willingness to throw to their running backs, it will be intriguing to see how Cunningham responds. With the return of first-round draft pick Marhson Lattimore, the cornerback landscape has changed a bit in just one week. P.J. Williams moved to starting slot corner, while De’Vante Harris joined Lattimore in the starting lineup out on the boundary. Crawley moved to the second unit with Sterling Moore who is exclusively playing in the slot now. Heading into the third preseason game P.J. Williams has set the pace among this group. 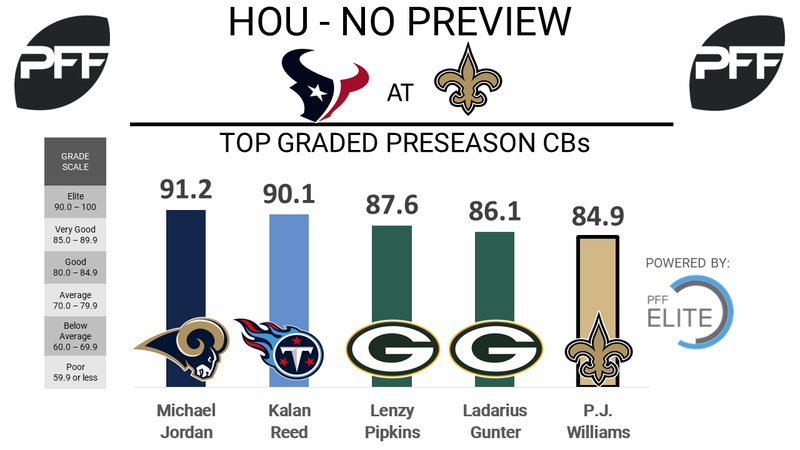 Williams has earned starts in both games playing 64 total defensive snaps and has been the highest graded player on the team so far earning an 84.9 overall grade, which ranks fifth among all cornerbacks this preseason. He has allowed just 0.63 yards per cover snap. De’Vante Harris has graded very well in this preseason. His 83.0 overall grade is the third highest grade on the team. Harris has allowed just three receptions on seven targets into his coverage for a passer rating against of just 60.4. Crawley has graded poor so far, this preseason earning a 44.0 overall on 78 defensive snaps. He has almost exclusively played outside, starting one game and coming off the bench in the second. With the return of first-round pick Marshon Lattimore, Moore moved to the bench exclusively playing over the slot and has been solid doing so earning an overall grade of 73.5. Alex Anzalone, LB – Anzalone got his first start of the preseason playing 22 total defensive snaps. His first start didn’t well as he earned an overall grade of just 40.0. On 19 run-defense snaps thus far he has made only one stop. He has struggled in coverage as well earning a coverage grade of just 48.0. Tommylee Lewis, WR – After earning the top grade among all wide receivers in preseason Week 1 at 89.8 overall, Lewis took a sizable step back in the team’s second preseason game, earning an overall grade of 67.9 On his 20 routes run, he caught just one pass for seven yards.